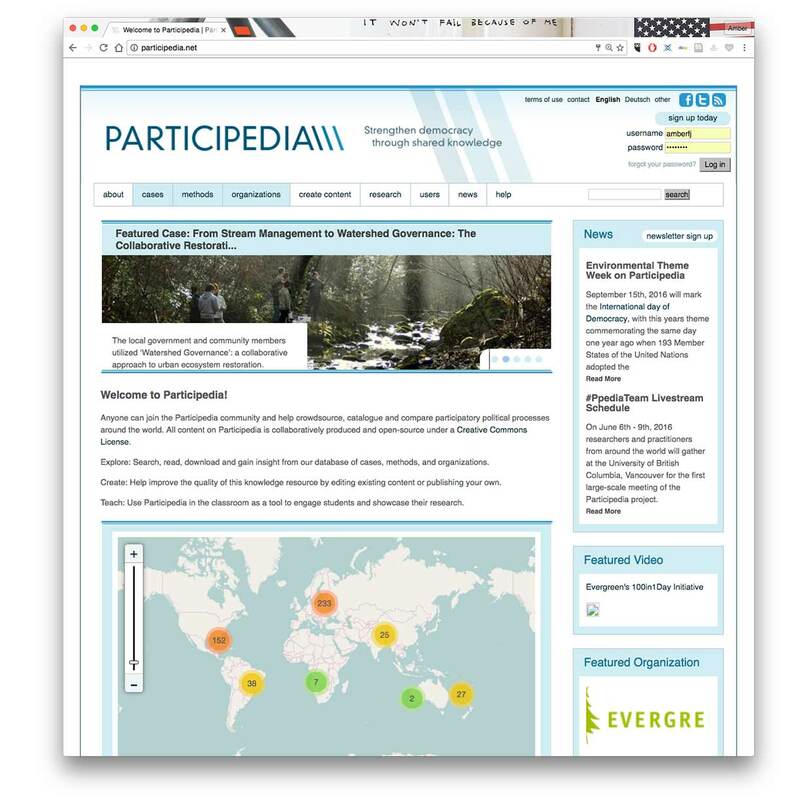 Participedia alpha site launched in 2011. 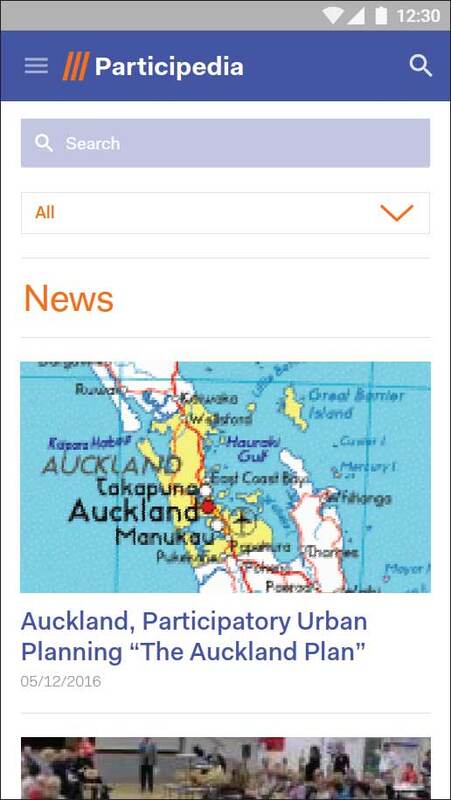 Participedia beta site mockups on desktop and mobile devices, 2016. Participedia beta testing site, 2016, to be officially launched in 2017. The Design & Technology Team that I established and lead includes Emily Carr Professor Katherine Gillieson (SSHRC Collaborator), a team of Emily Carr undergrad and Grad students, and former Mozilla Foundation Vice President David Ascher, who is the technology lead on the project. The Participedia Project responds to a transformation of democratic governance, one possibly as revolutionary as the development of representative, party-based democracy that evolved out of the universal franchise. 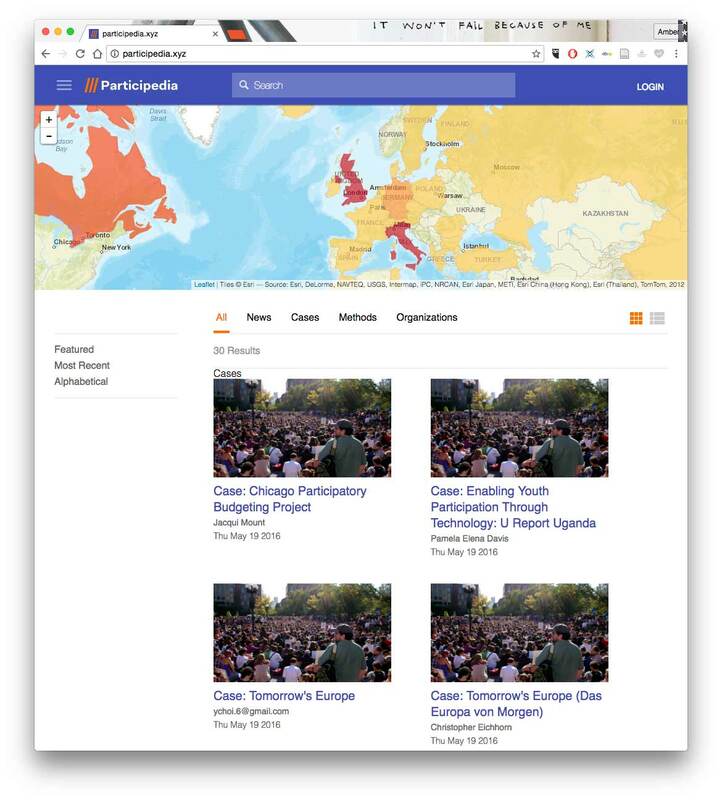 The transformation involves hundreds of thousands of new channels of citizen involvement in government, often outside of the more visible politics of electoral representation, and occurring in most countries in the world. These participatory processes vary widely in form, including citizens’ advisory panels, participatory budgeting, and innovative applications of new social media. Three factors are driving this proliferation. First, in most societies today, although electoral democracy produces broad mandates for government, it does not generate the legitimacy necessary for governing policy-specific areas, from environmental regulation to urban planning, from school reform to employment policy. Second, citizens are increasingly vocal and better organized. They now have the capacity to resist and undermine policies that are simply imposed, even by elected governments. Third, citizens also now have greater capacity than ever before to help solve public problems. Together, these factors are motivating a rapid development of participatory democratic innovations underneath and beside more familiar political institutions. Given this rapid and extensive development, we need to know what kinds of processes exist, and we need to know what kinds work best for specific problems and issues, for specific goals, under specific circumstances. We need to map this rapidly developing domain of political institutions. We need to explain why these processes are developing as they are. We need to assess their contributions to democracy and good governance. And we need to transfer this knowledge back into practice. The Participedia Project meets this challenge by combining an extensive partnership with new information technologies to create the information base necessary for high quality research and evidence-based practice. 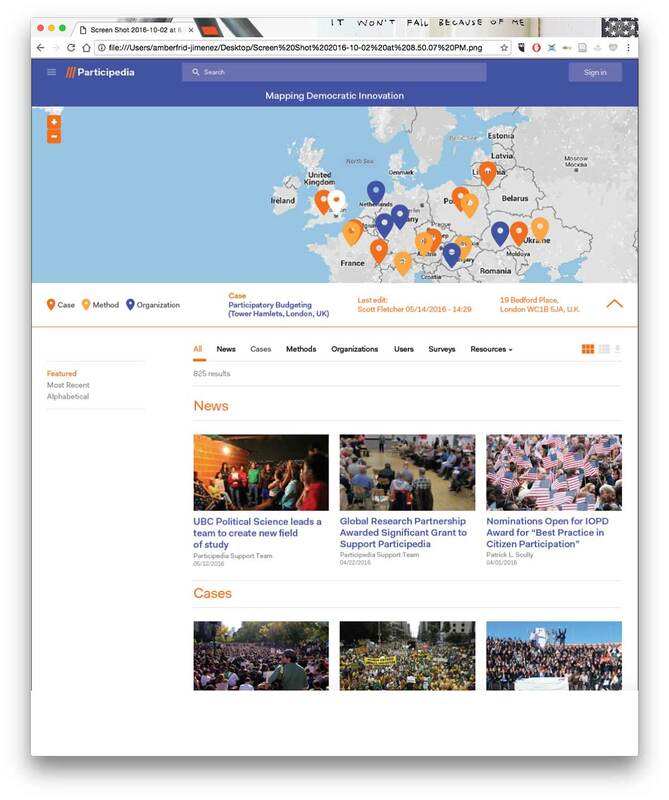 At its heart is an innovative research platform (www.participedia.net) that enables decentralized, collaborative creation and mobilization of knowledge in ways that will exceed the capacities of a more traditionally-organized research team. This Participedia Project will develop this platform and its supporting communities of research and practice by underwriting three objectives. First, it will support development of a very large qualitative and quantitative dataset on participatory processes and related democratic innovations. This dataset will in turn enable a new generation of high-quality research and teaching. Importantly, the grant will underwrite the development, testing, and implementation of a model for extensive, decentralized production of knowledge in social science—a model relevant to those areas in which knowledge is both complex and dispersed across policies, academic and practical locations, jurisdiction, and country. Second, this Partnership Grant will underwrite knowledge mobilization to improve the quality of democratic governance. It will provide public leaders and citizens with well-tested models for effective participatory and democratic processes. It will deepen and extend Canada’s support for smart and effective democratic innovations, both here at home and around the world. Third, this Partnership Grant connects an extremely strong group of Canadian universities and researchers across a number of disciplines—political theory, public policy, area studies, art and design, and data analysis—and places this group at the centre of a high quality and dynamic global partnership.